Parker sold some 20 million of their "51" pens over the three decades or so after its introduction in 1941, with one major mechanical redesign and a number of cosmetic updates, making them one of the most popular fountain pens in history; this despite the fact that they were never terribly inexpensive (the 1941 price of $12.50 equates to about $140 in today's money). It is easy to see why. The 51 was just about the best pen to be had in the closing years of the "golden age" of fountain pens. It was stylish, innovative and effective in design, rugged, and an extremely good writer. 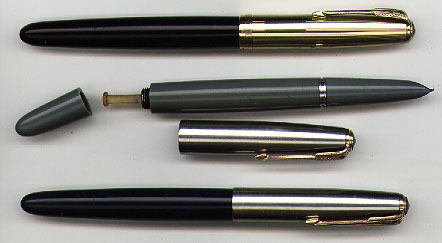 The 51 was the first in a long series of Parker pens that would be identified by numbers, a nod perhaps to the firm's growing export market (since numbers do not require translation). At its introduction, it was touted as the pen that was "ten years ahead of its time", but the specific origin of the name was that the design was completed in 1939, the 51st anniversary of the company. 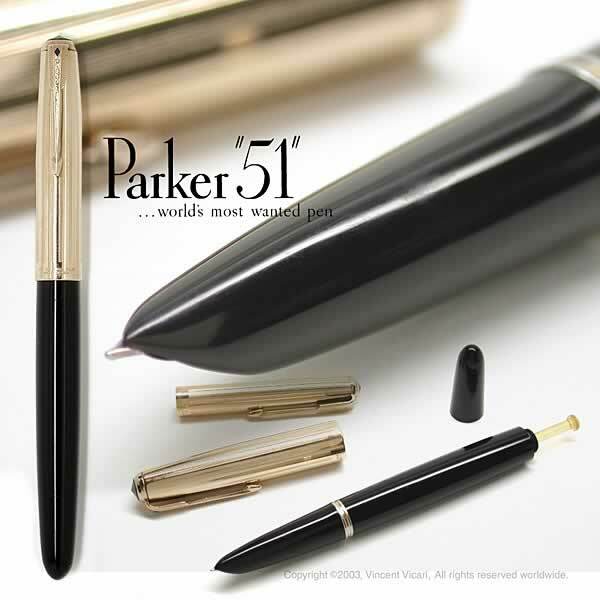 The Parker 51 can trace its origins back to the early 1930s, when Parker researchers began looking for a way to dispel the ancient curse of pen writing: ink that wouldn't dry. To this end, they had developed a new metallic-base ink that exhibited the required volatility, but they found that the ink quickly ate into the celluloid then used by most penmakers (Parker's new Vacumatic used the barrel itself, rather than a rubber sac, to hold the ink, so this was not an ideal state of affairs). So, it was off to Imperial Chemical of Great Britain to come up with a new material for pen barrels, a new methyl methacrylate resin that had just been trademarked under the name "plexiglas" (and also known as "lucite," or simply "acrylic"). It was lightweight yet very strong, denser and less porous than celluloid, and not flammable. It took colors well (and could be transparent, allowing it to be used in place of plate glass in aircraft windows and cockpits). Happily, it could be injection molded, which eliminated the work of machining pen barrels up from rod stock. Of course, if you use an ink that dries quickly on paper, it will dry just as quickly inside the point. To solve this problem, Parker shrun the point and feed radically and concealed them inside the section, leaving only the nib itself exposed, thereby limiting evaporation. This feature also gave the pen its futuristic appearance (its "jet snout" actually predates jet aircraft), and it would be heavily imitated all over the world in the years to come. Concealed inside the hood was the 51's secret weapon: a complex precision molding called a "collector" that could keep massive amounts of ink on tap without leakage. Parker 51 points are quite rigid, but their excellent ink feed helps them write smoothly and untempramentally all day long. The 51 also saw a return to the past with its slip-on cap. Held in place by spring contact with the protruding clutch ring (preventing scratching), the 51's slip cap was much more effective than those used in the last century (and thanks to the improved ink flow path, the cap did not have to make an ink-tight seal). In 1948, beginning with the smaller Demi model, the 51 was restyled slightly and fitted with an "aerometric" filler (actually a sleeve filler with a durable transparent sac concealed under the removable barrel). Beginning collectors are often advised to go for aero 51s as the most reliable and best writing fountain pens of any vintage. The tough "ply-glass" fillers seldom require more than a moderate cleaning to put them back into service. Perhaps no other fountain pen has been so unanimously acclaimed as a classic. Nor is it merely a triumph of styling -- though it has a place in the Museum of Modern Art's design collection, and Lazlo Moholy-Nagy found it worthy of praise -- for it is also one of the most robust and practical writing instruments ever made!